Hi, I am Jessica and I am so excited to be able to bring the world of Elimination Communication directly to you in the form of workshops and one on one guidance. I started doing EC with my daughter right form birth and have not looked back. It has been an incredible journey and I cannot wait to share it with you. As someone who feels that we can all learn a lot from nature and the environment, I am passionate about educating others, along with educating myself and the next generation on environmental issues. This was one of the reasons I choose to do EC and why I continue to inform others about this amazing experience. I look forward to teaching and inspiring parents and caregivers to learn about EC and give it a try. It is such a wonderful way to connect with your child. I have worked in the childcare field for many years and now that I am a mother, I am taking new steps in a different, yet very exciting direction. Serving Thunder Bay, Ontario, Canada. 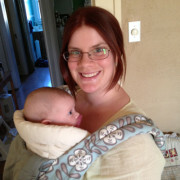 Visit Jessica's local Go Diaper Free Facebook Group here.